After surpassing its goal to reduce solid waste sent to landfills and water use by 10 percent by 2020, Hormel Foods continued to implement projects to achieve further reductions. The company remains on track to achieve its goals to reduce nonrenewable energy use by 10 percent and product packaging by 25 million pounds by 2020. In addition to reducing water use by 101 million gallons, Hormel Foods developed and published its Sustainable Agriculture Policy and completed a high-level water risk assessment of its top suppliers. 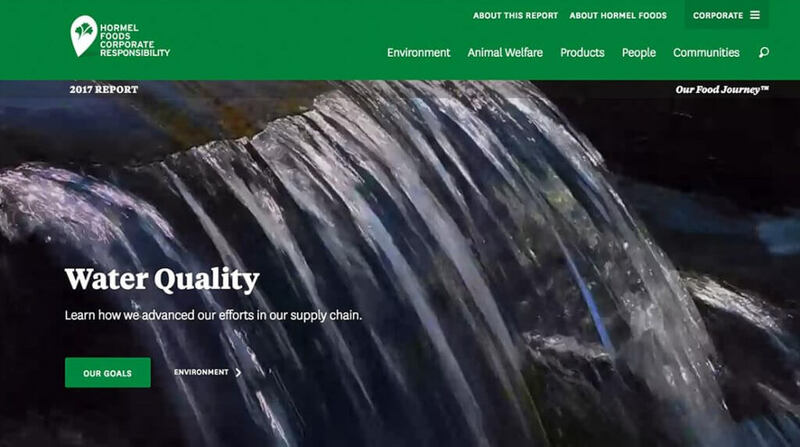 To ensure the accountability of its high standards for animal welfare throughout its supply chain, more than 2,000 audits were conducted. In addition, the company continued to advance its antibiotic stewardship efforts. These efforts consist of reducing the use of antibiotics, the responsible use of antibiotics, investing in producing raised-without-antibiotics products and working with others to create solutions through its Antibiotic Working Group. Hormel Foods launched over 520 new retail and foodservice items and also continued to advance its sodium reduction efforts and clean-label initiative. The company continues to place great emphasis on its diversity and inclusion efforts and has nine employee resource groups in place. Hormel Foods also continues to put the safety of its employees first by focusing on training, audits and improving its safety performance year over year. Hormel Foods donated $7.8 million in cash and product donations to help others. This includes $5.4 million in hunger donations, its donation of 2.6 million cans of SPAMMY® (a shelf-stable poultry product to help prevent childhood malnutrition in Guatemala), and more than $827,000 in education donations. The 2017 Hormel Foods Corporate Responsibility Report follows the Global Reporting Initiative’s standards and is developed in accordance to the core option. The report is designed to allow stakeholders to easily view top-line highlights. A downloadable PDF will be available in the near future as well. To view the entire report, please visit https://csr.hormelfoods.com/.